It seems that most folks’ awareness of history reaches back only 20 or 30 years. Few today can conceive of a world without laptop computers, cable TV, cell phones and Dancing With The Stars. Oh how dark and disordered life must have been before the internet! How did man survive? Old farts like me realize that history is a cumulative progression of events, and the things we take for granted today had an origin in the murky mists of time long past. So it is with the concept of longitude and the meridian. Today we take for granted that the zero line of longitude, the international meridian, runs through Greenwich, England. It seems just so natural. Most people today don’t realize that getting the meridian at Greenwich accepted as the world-wide standard was a long, drawn out process that spanned over a hundred years and involved most of the major world powers. What we take for granted today is actually the result of some pretty intense diplomatic and scientific battles. Man has realized since the time of the ancient Greeks that the Earth is round(ish) and that one of the best ways to refer to one’s position on this big ball is to use angular measurements – degrees, minutes and seconds. On land this convention wasn’t really important – the common man was content relating his location as distance and direction traveled from known points. There was always a track, trail or road that led to where he wanted to go. The history of the march of civilization is the history of road building. It’s coded into our DNA. But as soon as man started sailing out of sight of land things changed. There are no roads in the middle of the Atlantic. All sailors had to fall back on was positioning by latitude and longitude. With the explosion of maritime trade in the 18th and 19th centuries most of the big navigation problems were quickly worked out. By the late 1700s we had reliable navigation instruments (sextants and chronometers), most of the important places of the world had been charted and sea captains could reliably and safely make their way to the other side of the world and back carrying cargoes that made the ship’s owners immensely wealthy. But there was one last international navigation issue that was was still hanging out there in the late 1800s that needed to be addressed. The issue of a common meridian. Longitude however has always been the problem child of navigation. Part of the problem is that there is no natural zero line of longitude – the earth does not have a natural vertical equator. The other problem is that there are no fixed or unmoving celestial bodies – stars or planets – that could offer an easy reference for longitude measurements like Polaris does for latitude measurements. All the useful celestial bodies are in constant motion overhead. What was needed was first a fixed reference line – a meridian – and then in reference to that line the minute-by-minute locations of all useful stars and planets as they marched across the sky. The designation of the meridian also drove the publication of accurate nautical charts for use by merchantmen and navies. This was a monumental task that only governments could support. The realization that establishing a meridian and charting the night skies was a national necessity coincided with the scientific revolution of the 1700s. Nations were willing – even eager – to put their money and their best minds to the task; it became an issue of national pride among the major seafaring nations. Most also saw it as a national security issue. These efforts were some of the earliest examples of directed research – scientific investigation not for the sake of enlightenment but to meet a specific economic or military goal. As a result everybody who fancied themselves a bigshot on the global stage established their own meridian and published navigational charts and celestial almanacs referenced to their meridians. Most also required their navies and merchant fleets to use their meridian. Countries such as England (Greenwich), Spain (Madrid), France (Paris), United States (Washington D.C. and Philadelphia), Portugal (Lisbon), Norway (Oslow), Russia (St. Petersburg) and Japan (Kyoto) all developed their own meridians. Even non-seafaring nations like Switzerland and Romania tried to get in on the act. By the mid 1800s the worldwide nautical charting community had become a seafaring Tower of Babble; not everybody spoke the same positional language. At the same time the development of reliable steam power was driving an explosion of commercial shipping activity. As merchant marine activities became more globalized ship captains, owners and insurance companies began demanding standardized navigational charts and nautical almanacs. A ship captain sailing from Boston needed to know that when he got to Lisbon and needed a new chart he could walk into a chandler and purchase a chart that uses to the same meridian he was trained to use and was comfortable with. Seafaring nations realized that a single universally recognized meridian was a good thing. But whose meridian would be the winner? In 1884 the President of the United States, Chester A. Arthur, got representatives from all the key nations together in a big room at the State Department in Washington D.C. and told them to figure it out. By this time the US really didn’t have a dog in the fight; although we were willing to accept Greenwich, England as our standard Prime Meridian we were open to switching and were not going to push a US-based solution. My guess is that most of the attendees saw the US as something of a neutral party in this argument, which is why they agreed to show up and work things out. The ‘International Conference For the Purpose of Fixing a Prime Meridian and a Universal Day’ was convened on October 1st 1884 and ran for the full month. The proceedings can be found on the Project Gutenberg website. The proceedings are an interesting read from a historical, scientific and political perspective. The delegates from France did a lot of talking, extolling the glories of the Empire and the primacy of the observatory in Paris. In the end however Greenwich in England won out, in large part, I suspect, because at the time over 72% of the world’s shipping used nautical charts based on the Greenwich meridian. The Greenwich solution had the weight of numbers behind it and came without a lot of Gallic preening and posturing. Note who decided to take a pass on the final vote. Sore losers I guess. The conference addressed and adopted a number of other issues including the designation of a ‘universal day’. This is why we have Greenwich Mean Time, or GMT (also referred to as UTC) and the standard solar day starts, and ends, at Greenwich. 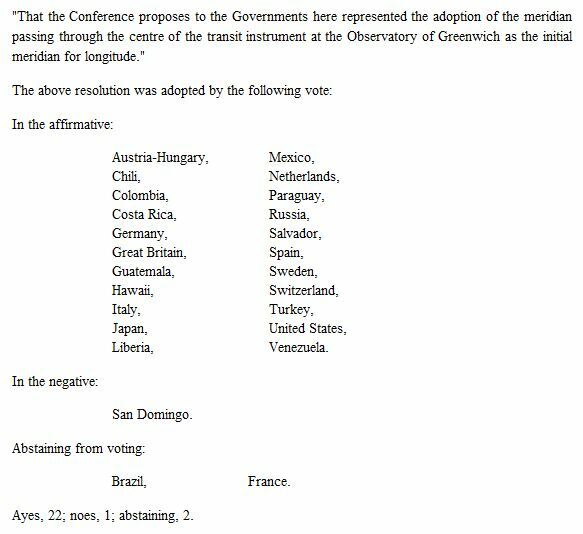 After the conference the US Congress moved quickly to adopt Greenwich as the standard prime meridian for all US-based mapping and charting. The US Navy and the Royal Navy began working jointly on the development and maintenance of nautical almanacs for celestial navigation and the sharing of nautical charts. This is a collaboration that continues to today. So there you have it. Something a seemingly mundane as the starting point for all longitudinal measurements around the world actually has a history that impacts us today. This entry was posted in History and tagged greenwich, meridian by Brian Haren. Bookmark the permalink.